I’m knitting a simple scarf, my first time knitting feather and fan. I love it because it’s interesting but easy enough that I can work on it during the day, which was exactly what I needed. You can’t really tell in this photo, but the yarn (Malabrigo finito) is a nice soothing colorway (coffee toffee) and I really like it. I finished reading My Antonia a couple of nights ago, and haven’t decided what fiction to read next. 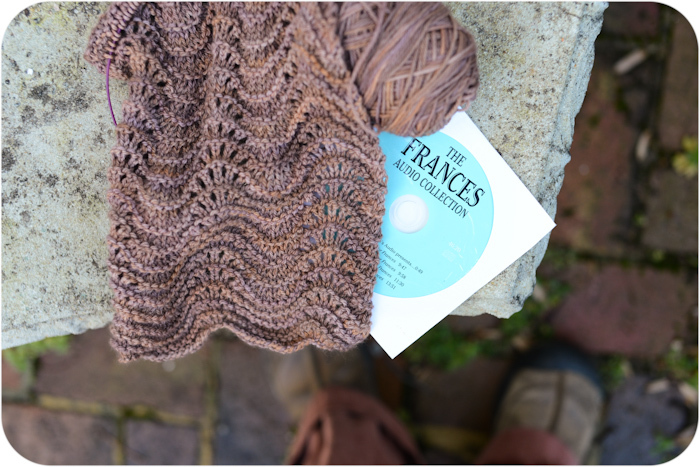 Yesterday we were traveling all day, and we listened to one of our family’s favorite CDs, the Frances Audio Collection . Even Jonny and I don’t get sick of it. The stories are delightful every time, and the narrator on this particular album is perfect. Looks like a busy day over here! Ahhhh wrong week! I’ll re post! better late than never, love the feather and fan pattern and soft vintage-y pink! oh, i love glynnis (sp?) too! 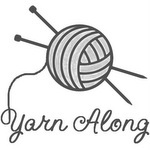 Thanks again, Ginny – it’s so much fun joining everyone here for the Yarn Along. Also, I just love the scarf you’re making! Wow, how have I missed the Yarn Along? 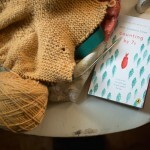 Books and crochet, 2 of my faves….I guess I have been hiding under a rock! Love the feather and fan. 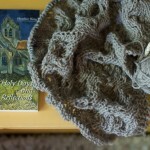 I hope to make the bonnet for a coworker’s little girl soon. Also – didn’t ask your friend about the needle case but started following her blog! She’s a great writer. I was hoping I could buy the case…a sewing pattern wouldn’t do me much good. Someday, hopefully! I’m sure I can find something on etsy. Where do you buy your needles? I usually buy from Knit Picks. They have nice affordable needles. For needle cases, already made, try Madbird. I recently got one of their cases and love it. The scarf looks like it will be a soft warm embrace to warm you during the cold weather. 🙂 I also like starting small to master a new stitch. 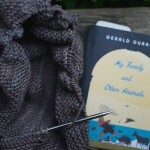 I haven’t posted a pic of my current knitting project this time – it’s a secret at the moment – but I’ve shared some knitty news and what I’m reading. I love the colour of that yarn Ginny, it’s lush! Sorry, no idea why it still say’s ‘Giveaway time’ on the link I posted as I know I deleted that. There isn’t a give away at the moment I’m afraid. Ginny, is it possible to edit that? I don’t want to mislead anyone. 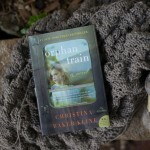 Not knitting currently, but just downloaded audio of Lev Grossman’s ‘The Magicians’. V. exciting. Just finished audio of ‘Her Fearful Symmetry’ by Audrey Neffenegger. Now I have to read textbooks for school– interesting but not exactly thrilling, I’m afraid. Highly recommend ‘The Scorpio Races’ by Maggie Stiefvater– a great read for young adults and old adults alike. Cheers. Ginny, you’re a Downton Abbey fan, right? You have to read “Lady Almina and the Real Downton Abbey” or “Below Stairs” – both better than fiction! I enjoy feather and fan too. Made a baby dress using the pattern a couple of years ago. Turned out beautifully. Feather and fan is such a nice pattern, once you get it down it is so easy to remember, plus it looks fancy. Started Christmas knitting, yeah I know a little early but will lose steam after a while so have to start early. I love the feather and fan pattern! That yarn is beautiful! And it looks so soft! 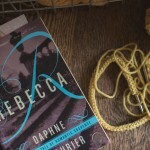 Talk about comfort knitting! We love Frances!!! Did not know there was a whole audio collection; we’ll definitely be looking into that! You always have the most beautiful yarn. The colour is beautiful and I love the pattern. I’m in awe of those of you who can manage such fine work. 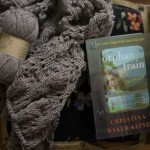 That scarf is gorgeous- love the pattern and the colorway. Feather and Fan sounds fun, something I want to try one day. Thanks again for hosting this wonderful Linky! I love the yarn you chose! Oooh, I love a feather and fan, I think it shows off yarn beautifully! Wonderful color for yor scarf – but it does not look as if the pattern were truely easy! Oh my goodness – I love that scarf! The colorway does look very nice and soothing.